Let me tell you a story. There is a ditch between the pleasure we receive from an artwork and truly seeing what the artist did. With Steve Galloway’s pictures, I could be stuck in the ditch forever were I asking help from books. One of the smartest tells me that “we don’t know how art began any more than we know how language started.” (E. H. Gombrich) Therefore, I must thank yesterday’s sunset: it was a scattered movement of light fighting the grayness through the clouds. As the light grew dim, electric ovals, intertwined, drew in the sky one of the most classical and mysterious secrets of painting: how the painting itself generates light. The sky became an immense painting over the city of angels which is desert and money and romanticism and politics, but the desert comes first. As an artist, Galloway is a son of the desert. A master in the land of nothingness, where our individual nature is the least part of ourselves. He questions the space, the sunlight, artificial lights, transient colors, bushes, rocks, animals, insects and paints them as estranged presences; history will never box them in. Galloway’s house, the mouse, the spider or the red bed underwater bring up the triumph of a detached isolation. “Look at me, I’m a different bed, you don’t know me. Only Steve can touch me, not even him, his brush, or his pencil does, I’m powerful. 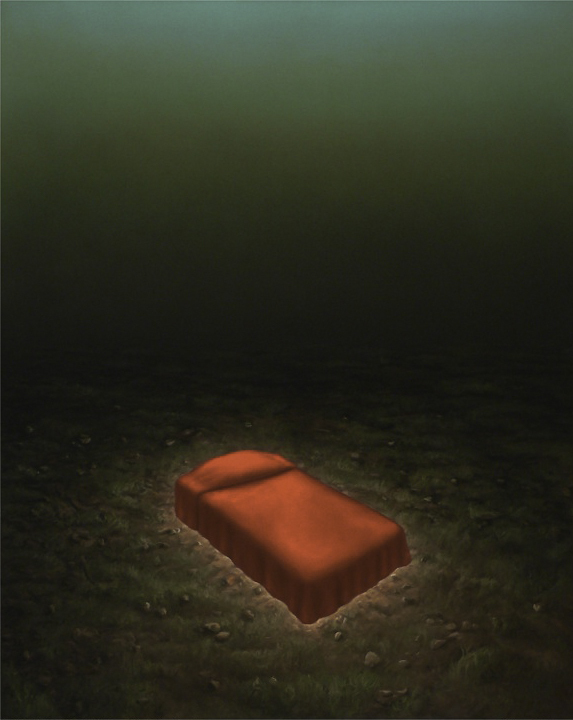 I’m a light plant.” The red bed has become the quintessence of an heroic solitude, a king hiding the crown. A medusa bed? 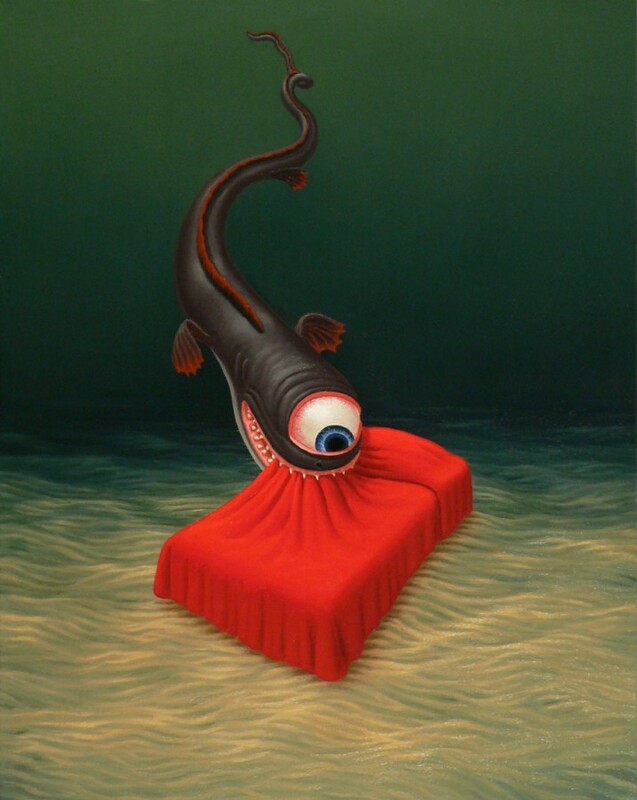 When the aquatic Polyphemus bites the red cover, then really the bed’s power flows over the sand surface and goes far, far away. That’s the art: a common object mutates into a magical presence and we can feel it’s power. Yet, before the sunset I hadn’t seen that each scene built in Galloway’s mind doesn’t include shadows. 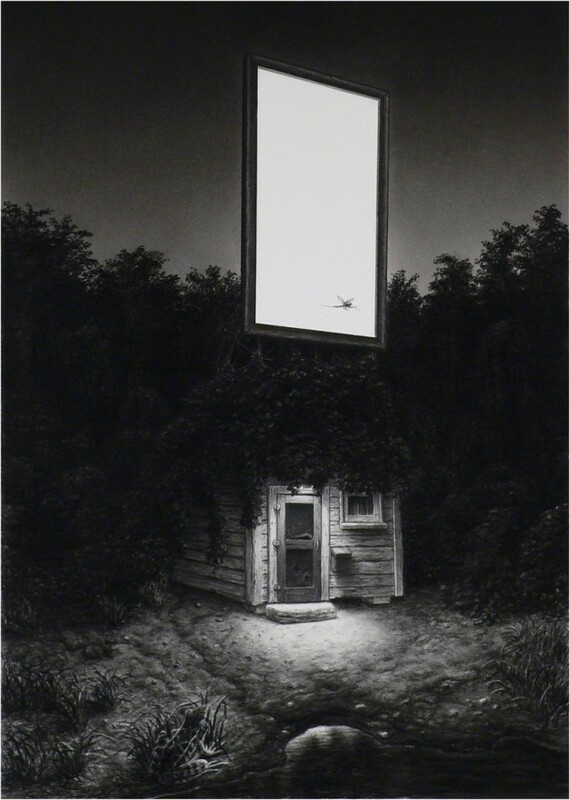 The opposite happens: the painted image diffuses the light it contains, may we call it life? Images mark their presence on the ground in spite of realism or physical limitations. They play with words, but don’t reveal the story. Bushes devouring a little house, a big frog hoping to eat the dragonfly. Our eyes eating the image in one blink. Although constantly threatened, this imaginary universe is meant to expand as a message of freedom. Is the mouse dreaming to be Cootie Williams while he blows the trumpet? 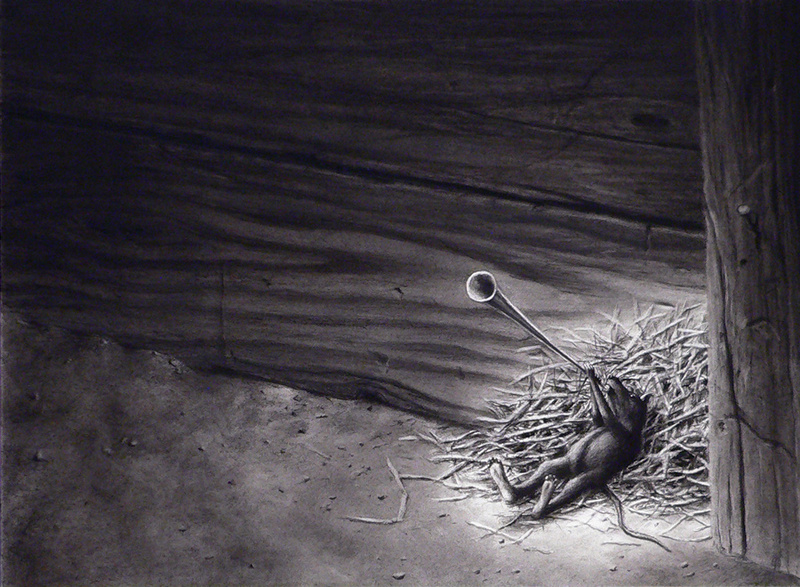 Is the TOOT the center of desire that generates light around the little animal on the straw? Whatever the environment, the circumstances, it is, is cause for joy. Steve Galloway, TOOT 2013, Pastel et fusain sur papier, 38 x 28 cm. I believe that I like to see what is seen. I believe that I like to see what bothers me. But anything flying around is. Therefore there is the universe. Because it is flying around.